Two days before the 2014 Emperor’s Challenge, my fellow-hikers were an obvious choice: Kris Swanson, Jon Heinze and Daniel Helm. As it turned out, they would finish first, third and fifth in the race. In retrospect, taking these precious sets of knees and ankles for three kilometres up a canyon, leaping from rock to slippery rock, wading through pools most of the way, and scrambling up a couple of waterfalls, was perhaps a bit unwise. Fortunately no serious injuries were sustained. Part of the magic of exploring such a creek lies in considering that perhaps no human feet have ever been this way before. Perhaps a First Nations hunter was here thousands of years ago, perhaps pioneer trapper John Terry felt the need to fully explore his backyard. But why would anyone else want to subject themselves to this hardship when there are easier ways to get around? Only if they are attempting a canyon crawl or hunting for dinosaur tracks, and we were doing both, grateful for the total absence of beer cans, plastic, or other signs of human civilization and progress. Just when we were almost ready to turn around and feared we might have been skunked, the sun came out, shining at a perfect angle onto a great rock face high above the creek. The resulting shadows outlined the unmistakable patterns of dinosaur trackways, visible even from a considerable distance below. Then came the rush and the high-fives, the thrill and privilege of knowing that no human eyes had appreciated what we were about to experience. 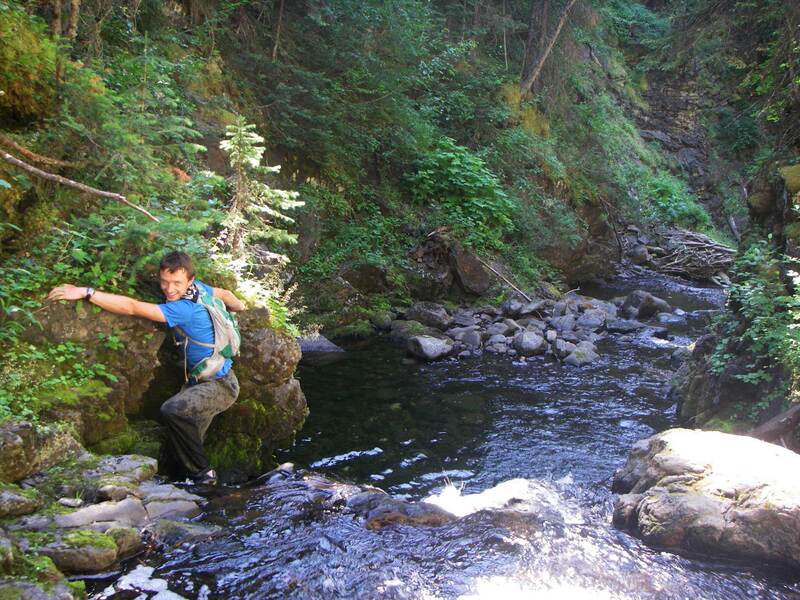 We were able to scramble up the steep slopes to the base of the exposed rock layers and touch the trackways. Four successive rock layers, each with a track or trackways, speaking of an area used repeatedly by dinosaurs over a stretch of time. And intriguingly, a variety of types of tracks, some of medium size, others exquisitely small. 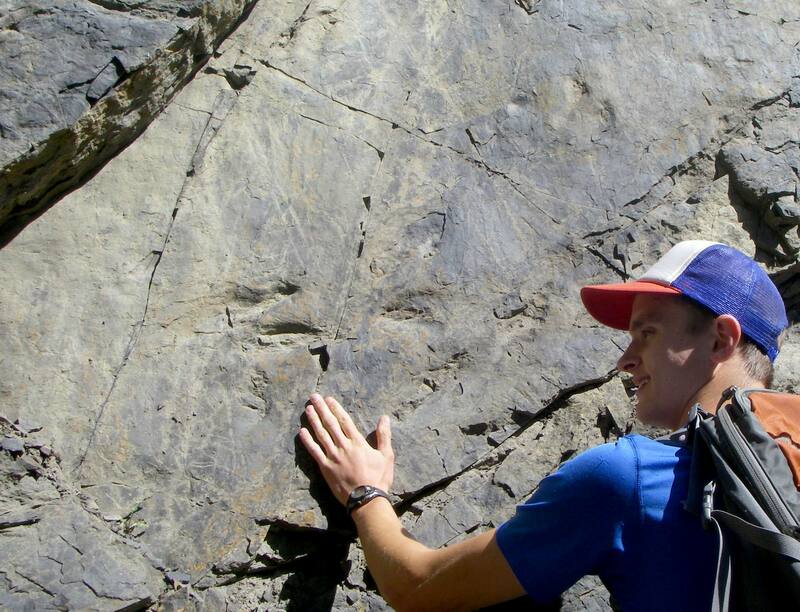 We knew from our geological research that these were probably the oldest sets of tracks yet discovered in the Tumbler Ridge area, from the Jurassic-Cretaceous boundary. Next step: take numerous photos, get a GPS reading, write a trip report and present it to scientists Rich McCrea and Lisa Buckley of the Peace Region Palaeontology Research Centre in Tumbler Ridge. Their expertise will be brought to bear on these tracks through a site visit and photogrammetry. In time, there will probably be a new McCrea & Buckley research article, and replicas of these new trackways may be on display in the Dinosaur Discovery Gallery – one more item that may elicit a sense of wonder and awe in visitors who may come to enjoy the Tumbler Ridge Geopark. Such ongoing activities help cement the reputation of the proposed Geopark as an active area of discovery and cutting-edge research. I remain amazed at the capacity of the Tumbler Ridge area to continue yielding exciting secrets like this year after year. I have often claimed that I live and work in the best place on the planet. Such a claim requires evidence, and I present this story as one snippet of evidence. Where else in the world can a half-day trip after a morning at work yield such fascinating results? Likewise, two weeks of vacation in August do not mean jetting off to a distant exotic location, but staying put, and further exploring the exotic destination that is home. The Tumbler Ridge rocks are the gift that keeps giving, and in this case the Geopark and the Museum are the fortunate beneficiaries.